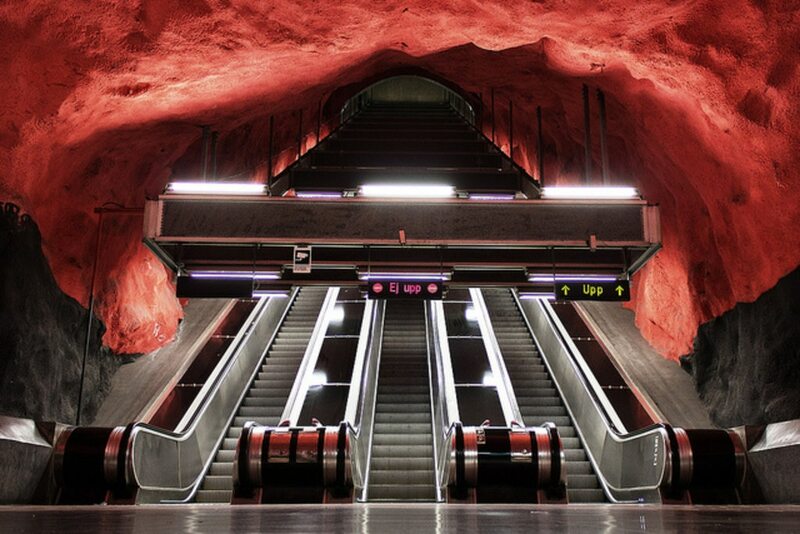 Known as the world's longest art exhibition, taking the subway in Stockholm is more than just a means of transport. Prepare to dive head-first into an underground world of immense creativity, where a metro trip takes you on a journey through time, dating all the way back to the mid-twentieth century and leading you through to the more recent innovative art-experiments of today. 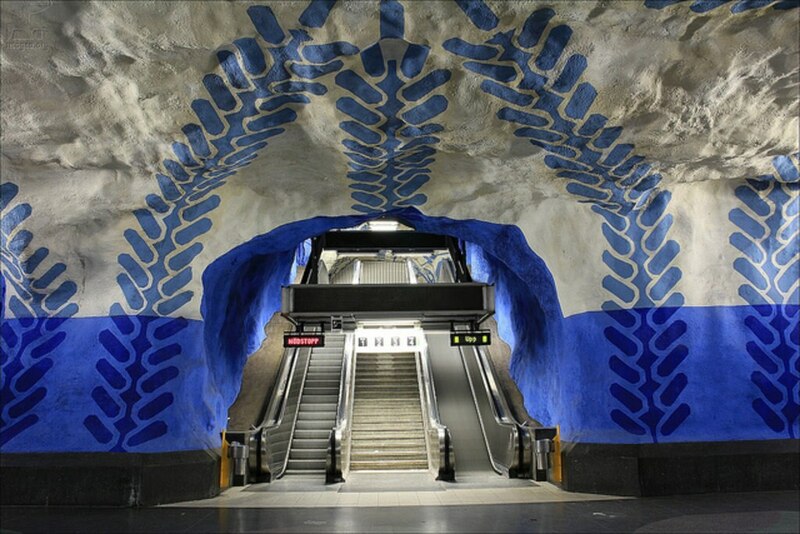 Out of the 110 subway stations dotted along the three lines of the Stockholm metro system (blue, red and green), 90 of them are decorated with sculptures, mosaics, paintings and engravings, carried out by over 150 artists. Below you'll find a list of Stockholm stations that are definitely worth a stop when you're visiting the Swedish capital. The blue line's Kungsträdgården was opened in 1977 as the 91st station to join the Stockholm metro. Located 34 metres underground, it features several historic remains from buildings that were pulled down during redevelopment in 1950. It's like walking around a reconstruction of the old Makalos Palace, complete with the building's original grand vaults and carved stone columns. Bang in the middle of the subway map and the easiest way to catch a glimpse of the metro if you're pushed for time, the walls at T-centralen station host a collection of stunning murals. Incorporating man-made materials into the original cavern walls of the underground, this station is a must for any design enthusiast. Look out for vintage 1950s tiles adorning the walls here. 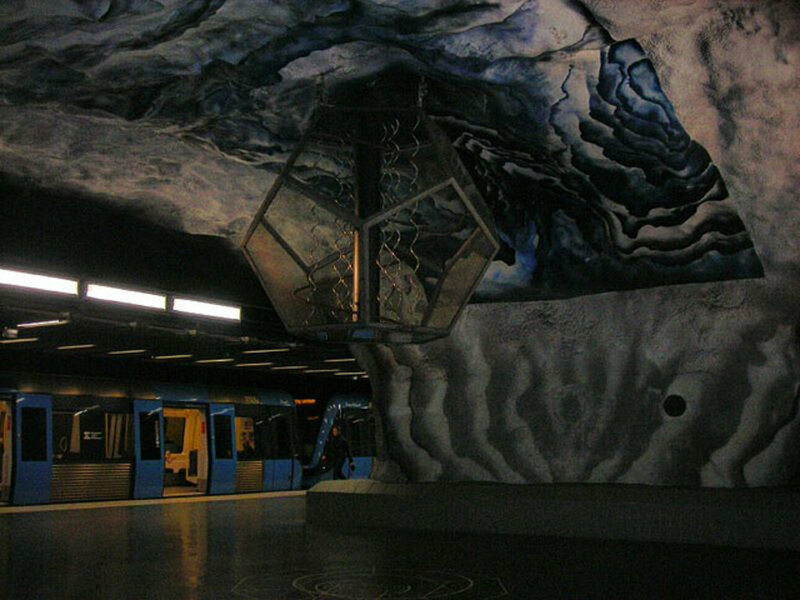 Located only 5km from central Stockholm, Solna Centrum metro station is one of the main attractions on the Stockholm metro line, with original rock walls painted by artists Anders Aberg and Karl-Olov Bjork. Depicting a fierce landscape with a deep, blood red sky and an array of black silhouette houses on the horizon, the mural is said to represent rural depopulations and the destruction of nature and the environment in Sweden. The panorama runs all around the station spanning almost 3000 feet - an incredible work-of-art. Thorildsplan station is the latest station on the Stockholm metro line to receive a makeover. This green line station was given in a revamp in 2008, bringing it to life with gigantic pixels, symbols, data icons and Pac-man characters, inspired by popular retro video games. In fact, the artist has created his own game, giving you the chance to journey through another dimension and capture a UFO on your morning commute. Follow the arrows, tunnels and ladders to find your way out onto the street and complete the level! Located in the districts Östermalm аnd Norra Djurgården near the Royal Institute of Technology, Tekniska Högskolan sees thousands of visitors each day and is one of the most popular stops on the red line. Known for its distinctive mathematical symbols and hexagonal sculptures, this subway station presents an almost futuristic theme to contrast the more historical entries on the line. 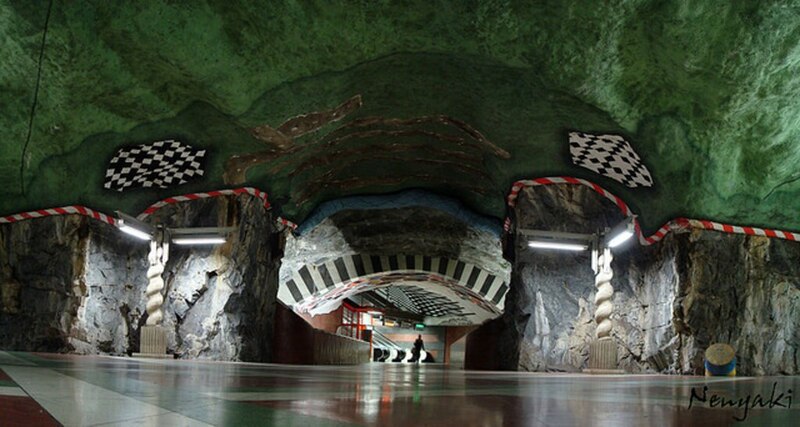 These are only a few of the stations worth visiting on the Stockholm metro lines. Forget museums, head on underground for the most innovative art exhibition you'll ever visit. The creativity showcased here makes a metro journey feel somewhat exquisite - who could have ever thought riding the metro could be this much fun? Well done Stockholm, we salute you! Images by Nenyaki, Imagea.org, Jakub, Dorian - used under Creative Commons license.